If you think you're going to show up at a 3 gun match with your concealed carry belt or a basic reinforced nylon belt, you've got another thing coming. The other night I tried to load up my Uncle Mikes Reinforced Instructors Belt and run a few speed loading drills with my new shotgun, and all I got was a rude awakening. 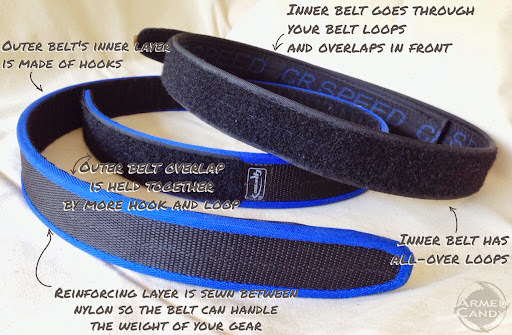 The following images are of a CR Speed belt, but there are a number of other companies who make similar models. A competition belt, similar to a "duty belt" has two layers. The inner layer is usually nylon and gets woven through your belt loops. It's outer face has the soft "loops" of a hook and loop system, sometimes called Velcro. The outer layer has an inner face of "hooks" that grab the inner belt and hold it around you. Both pieces overlap in the back and are held together with a "keeper". Without this dual layer system, your gear would be held too close to your body and would become less affective and reachable. It would also dig into your legs and/or stomach and that would hurt. The hook and loop also captures whatever gear you slide on the outer belt, and holds it there so it doesn't slide around. 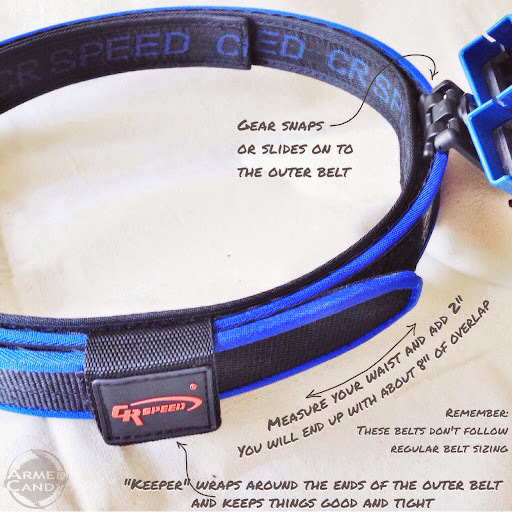 This model of CR Speed's belts also come in a number of fun colors. Originally, they offered red, blue, black and yellow. Now they have begun making pink, purple and green giving you tons of color combination opportunities!